Stage Nature Center Summer Camps 2019 – Fun nature-themed outdoor camps all summer long for kids ages 4-14 at the Stage Nature Center. Stage Nature Center in Troy hosts fun outdoor summer day camps at their 8,200 square foot interpretive building and nearly 2 miles of walking trails that wind through 100 acres of Michigan landscapes! This camp gives your child a special opportunity to explore the science of ecology, the study of the interrelationships between living things and their environment. Every adventure-filled day will include fun interactive games, activities, and crafts. 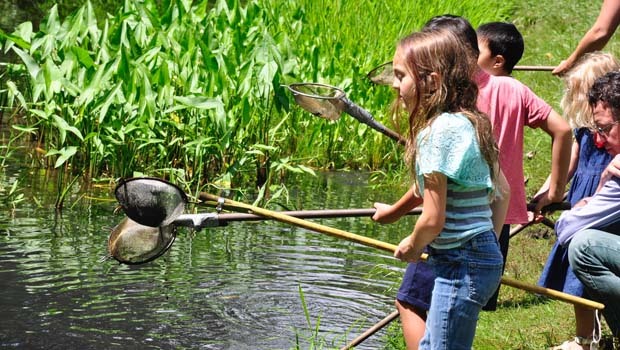 Children will use pond nets to catch aquatic animals, sweep for insects in the meadow, explore the forest, experience the darkness of underground or the night sky, look for signs of wildlife along the trail and much more. Bring a sack lunch each day. We will provide beverages and an afternoon snack. Children will explore forest, meadow and pond, observing the animals and plants found in those communities. Catching and observing insects, hiking the trails, watching birds and other animals at the feeders, playing simple nature games and making crafts with a nature theme are some of the activities that will take place. Each child will take home a “bug” box and a magnifying lens. Captivate your child’s creativity this summer with our camps full of science surprises. Children will dive-in “hands first” to amazing science projects that incorporate STEM educational practices. They will learn the secret formulas to mixtures like slime, putty, moon sand, and more. Children will explore the sun and the energy it gives to the earth. Do not miss out on the chance to discover simple yet startling science phenomena – sign up now. Bring a sack lunch each day. We will provide beverages and an afternoon snack. Register today for Stage Nature Center Summer Camps!